Lelo in Nopo: Can you smell the Rose Festival? The Rose Festival is happening here in Portland, the Rose City, at the same time our own Rose Festival is occurring in the garden. I've been searching for the blog plug-in for smell-o-vision so that you could smell this post, but alas, no such luck. 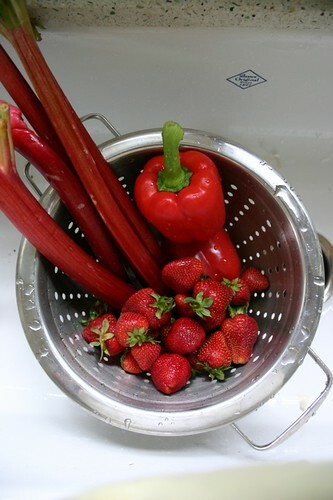 But today I was thinking, while I was roasting garlic, and grilling asparagus and red bell peppers, and making strawberry rhubarb cobbler in preparation for our guests, how lucky I was to be able to be doing this. I can work when I have work, and play when I have play. And cook with all red things apparently, too. 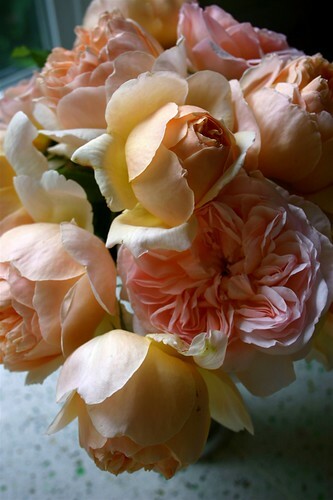 And today I picked buckets of heirloom roses from the garden and filled the house with their heady sweet scent. Some smell deep like spice. Some smell like sugar. Others smell like rose water. 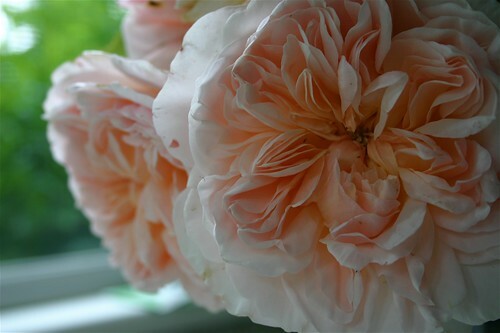 I crazy love heirloom roses. Not the fussy hybrid tea roses. 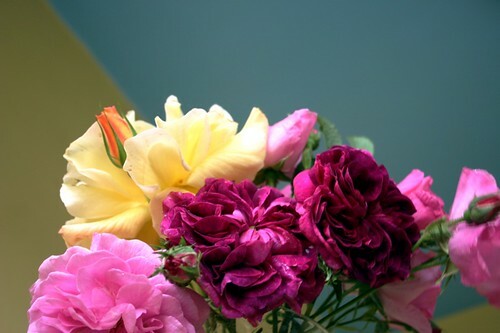 These are roses that grow on their own roots, passed down among families and growers. Roses with french names, and romantic names. Roses that grow in cupped whirls of decadence. Indulgence. Sweetness. Simplicity. See the deep purple one? It smells deep and musky, almost like cloves. With an edge of sweetness to it that turns into layers of thick velvet wine. It blooms only once during the season. And now's the time. Sieze the moment is its message. So I am. I absolutely ADORE roses. I've never been to a rose festival, but will have to see if we have them in this neck of the woods. Oh I wish wish wish I could smell the rose festival! One of my favorite scents! Boo Hoo. I want SCRATCH-N-SNIFF. Now! The Rose Festival princesses and their escorts, the Rosarians, all came to my work today. We all went a little crazy. 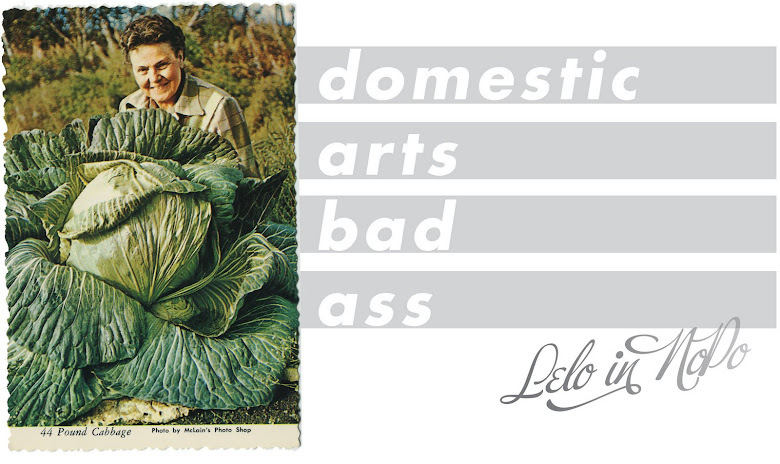 Thank you, dear, sweet woman, for sharing these lovlies. We were so tickled to find that gorgeous bit of pink in our windshield wiper! I only like heirloom roses, not those horrid florist roses. Those are gorgeous! Beautiful! It's so wonderful to find other rose lovers, as they can sometimes have negative connotations of being too old-fashioned. My mum has a rose nursery south-east of Melbourne (Australia), and she specialises in David Austin/Old English and old-fashioned roses - I love them when they ramble over everything.